City Chinese Orchestra will be conducting its first performance tour to Taiwan entitled “Tunes of Nostalgia”《乡韵情怀》this December. The orchestra will stage its first performance at the Tainan City Guiren Cultural Centre Concert Hall on 15 December (Sun) at 7.30pm; its second performance will be in Taoyuan County at Pingzhen City Cultural Centre Arts Hall on 17 December (Sun) at 7.30pm; while its final stop will be at the Hsinchu City Cultural Bureau Concert Hall on 21 December (Sat) at 7.30pm. Conducted by Dr Tay Teow Kiat, the orchestra will also feature dizi maestro Zhan Yong Ming and erhu soloist Wang Gui Ying. With 39 years of history, City Chinese Orchestra has constantly sought to provide Chinese music lovers with distinct genres of works. 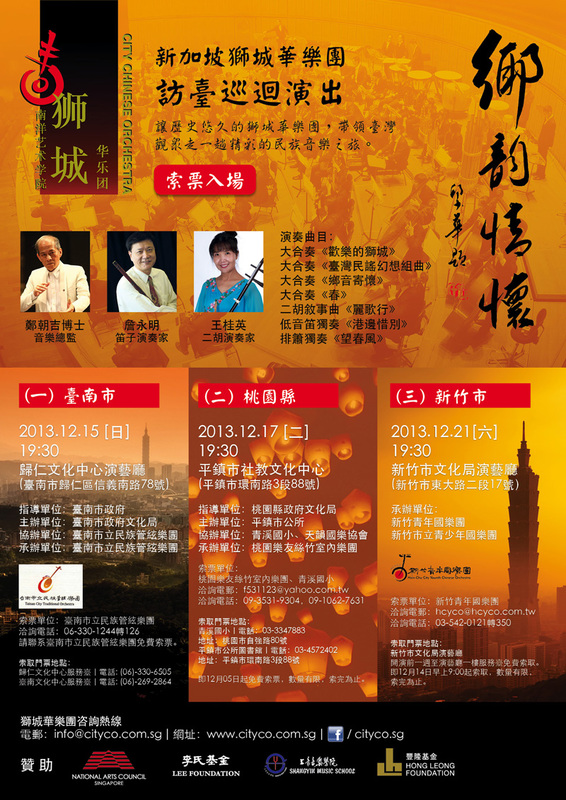 This December, the Orchestra will be presenting several classics to the Taiwanese audience, such as orchestral pieces like Longing for Reunion《乡音寄怀》, Lyrical Moon《月儿高》,Fantasia of Taiwan Folk Songs《台湾民谣幻想组曲》and Spring《春》. The repertoire also includes a newly commissioned piece by Taiwan-based composer Lo Leung Fai, Celebration in the Lion City《欢乐的狮城》, describes the colourful diversity and character that is Singapore today. In addition, dizi maestro Zhan Yong Ming will be performing two pieces, Spring Breeze《望春风》(on paixiao) and Lamenting Our Separation by the Jetty 《港边惜别》（on diyin dizi），while Wang Gui Ying will perform erhu concerto Song of the Li Tune《丽歌行》. • You may get your tickets for free from 1 December 2013 onwards at Guiren Cultural Centre Service Counter or Tainan Municipal Cultural Centre Service Counter. • You may get your tickets for free from 1 December 2013 onwards at Xiguo Primary (Tel: +886 03-334-7883) or Pingzhen City Public Library (Tel: +886 03-457-2402). • You may get your free tickets from 14 December 2013, 9am onwards at Hsinchu City Culutral Bureau Performance Hall, Level 1 Counter. Copyright © 2019 City Chinese Orchestra All Rights Reserved.